Tax exception is a type of a tax deduction that reduces a taxable income by a specific amount. In this article I discuss a personal tax exemption although the term tax exemption may also refer to acquaintance from paying taxes on all generated income. Those types of tax exemptions are typically granted to charitable and religious organizations, state and local governments, educational institutions, or non-profit organizations just to name a few. Going back to the personal tax exceptions, it a set value that is subtracted from your total income and for 2013 tax year that amount is set at $3,900. Each exception can be claimed for yourself, your spouse (if filing Married Filing Jointly), and each dependent. If someone claims you as an exception (dependent) on their tax return, you cannot claim a personal exception when filing taxes separately. Average growth of personal tax exceptions over the last 15 years has been 2.45%, which is trying to stay on par with inflation. With the slow growing economy and official inflation rate still below Fed’s long-term target, one should expect below average growth of this benefit. Are there limits to personal exemptions? The IRS has determined that the individuals whose income surpassed the phaseout limits will have their exceptions reduced by 2 percentage points for each $2,500 going over the limit. For married couples filing separately that amount is $1,250. In a fictitious scenario let’s assume we want to see how the personal exemptions will change for two individuals who are married and are filing jointly. Their total income is $345,000 and they have two children. In total they claim four exemptions, two for themselves and two for their children. 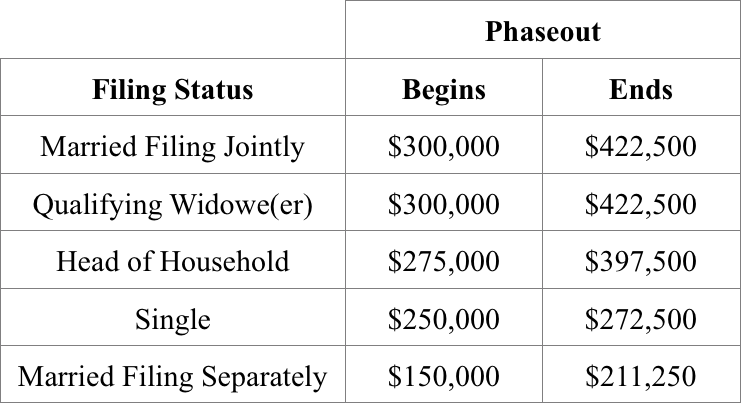 First, let’s look into the phaseout table and for Married Filing Jointly it begins at $300,000 making them go over the threshold by $45,000. The next step is to divide the $45,000 over $2,500 (see paragraph before). That gives us 18; this number is now multiplied by 2% by which a reduction in exemptions will occur. That number is 36% by which we will multiply the entire exemption for this family. For 2013 the exemption amount is $3,900 times 4 exemptions gives us $15,600. $15,600 times 36% is $5,616. Because this family’s income went over the exemption threshold by $45,000 the total exemption of $15,600 is reduced by $5,616 effectively leaving the family with the personal exemption of $9,984. For more help on how to calculate a reduction in your exemption amount, look into Worksheet 2-6 in Publication 505. Reduction in personal exceptions Worksheet 2-6.